Yep, its that time again, I'm another year older. Each year for my birthday, I like to do something fun with the family. It's rather convenient when the weather cooperates with me. This year, the weather was perfect and the leaves are beautiful. On Sunday, the day before my birthday officially, we took a trip to Elligay, Georgia to get apples and a pumpkin. As an added bonus, we went up and over Fort Mountain, which is where my hubby and I met. The views from the lookout never fail to amaze. Next, we drove into downtown Ellijay and smack into the apple festival. Imagine tons of people, and lots of traffic. I'm sure the festival is fun, but we didn't stop to find out. We pushed on through and finally arrived at Hillcrest Orchards to buy apples. We visited last year with our homeschool group and have been dreaming about their apple cider, apple pies, apple donuts, and pink lady apples ever since. It too was a madhouse, but we got our apples and headed up the road to Burt's Farm to pick out our pumpkin. Now I know you can buy a pumpkin at any grocery store or Walmart, and they are a bit cheaper. Why drive all the way to Ellijay, you ask? Its kinda like going to a Christmas tree farm and picking your tree rather than putting up a fake tree or buying one at Home Depot. Its the experience! I have never, ever, seen such big pumpkins in my life. This year they were more picked over and not quite as large as last year, but still rather impressive. The one Ryan (in white) is leaning on is $46. Can you imagine paying that much for a pumpkin? Not me! The farm is a wonderful place to get some great fall pictures. They even have hay rides for the kids. Let me just say that picking a pumpkin from such a wide assortment of colors, shapes and sizes is no easy task! Nobody could agree on one. Here was Adam's choice. In the end we got a larger pumpkin that didn't cost that much. We'll be carving it into a masterpiece this weekend. The kids also each got a tiny little pumpkin each. Here they are with the super cool white pumpkins at the farm. Here's daddy wheeling our pumpkin to the front. Such a fun day! He was sitting right in the middle of the path just begging to get run over. When I first rode by I thought it might be something off a tree. It was HUGE! I'm talking as big around as a carrot and about 3 inches long. 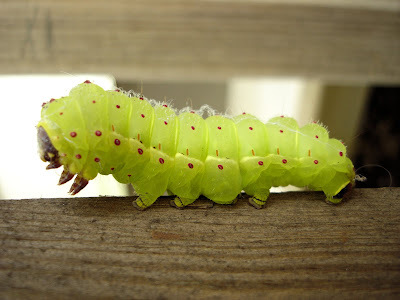 I have never, ever seen a caterpillar that big. He was also brilliant lime green. No way was I actually touching him, but I did find a small stick and move him off the path. I guessed at the time that anything that big and awesome looking had to turn into something cool. My guess was a Luna Moth. I was right. I just wish my boys had been there to see him. Ryan loves caterpillars of all kinds, and this one was a doozy! So, I'm sore, but had such a wonderful day with friends and family, that I'd happily do it again! If you've never walked or biked the Riverwalk, I highly recommend it. Its such a great trip with gorgeous views of the river, wetlands, cool factories, surrounding mountains and so much more. After raising 7 foster kittens this past spring, I said I was done with fosters for a bit. Little did I know that I had yet another surprise heading my way. Haley was at a friends house for a play date when she found a tiny little kitten crying and begging for food, sitting beside his tiny dead sister, abandoned by their mother. Apparently, some of the neighbors near her friends house feed the local stray cats, but don't do anything humane like call animal control or spay/neuter them. They have litter after litter of kittens each year, and each year those same kittens suffer. This little guy got lucky because my daughter knew what to do. When my husband came to pick her up, she showed him the kitten, shared the story of his poor sister, and low and behold, I received yet another foster kitten. This little kitten was in the worst shape that I have ever seen a live kitten in. Every single bone in his tiny body was highly visible. He weighed less than half of a pound. His eyes were crusted shut and he was covered in fleas. I honestly didn't know if I could save him. He was that dehydrated and thin. But, this kitten is a fighter. Here's Pumpkin, our latest baby foster. He's now happy and healthy and is looking for his forever home. He's still tiny, and I don't think he's going to be a very big cat. He is a bundle of energy and spends his days enjoying his new lease on life to the fullest.